Right now I feel worse than a trampled cockroach. I have never seen so many armed forces defending the individual interests of a multinational company and bypassing the collective interests of the farmers. 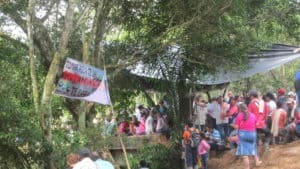 Between 4 May and 30 June 2015, around 100 local farmers (campesinos) held peaceful protests in the Colombian Amazon (Valparaíso, Caquetá) against the entrance of Emerald Energy Plc, which is a UK based oil company and a subsidiary of the Sinochem Group. Three protestors were injured on Tuesday, 30 June, when the peaceful demonstrations became violent after clashes erupted between the anti-riot police (ESMAD) and the campesinos. Peaceful demonstration against extractive industries in Valparaiso. In 2012, Emerald Energy received a land concession from the Walnut Block (Bloque Nogal) and began conducting experiments on soil conditions for future extraction projects. The company argued, based on their own studies, that exploitation would not have an environmental impact on the land. Valparaíso is part of the Colombian Amazon. It is a highly bio- diverse region with a plethora of unique plant and animal species. The local community fearing that activity by Emerald Energy Plc. would cause damage to the environment and contaminate the water. The inhabitants have therefore formed the “Commission on Life and Water”. This Commission asked Universidad de la Amazonia to conduct an 8 month study on the biodiversity of Valparaíso and the surrounding area and the possible impacts of Emerald Energy Plc. Awarding oil blocks goes against what President Santos promised to the United Nations – to protect and recover the Amazon ecosystem. The campesino leaders have promoted dialogue with local authorities and relevant institutions. By 27 June 2015, they had met with the Mayor, the Governor, the Corpo-amazonia (local environmental agency), the Chamber of Commerce and the Catholic Church in order to present the information from the study. At the same time the campesinos held a peaceful protest on a bridge over La Cacho gorge to prevent Emerald Energy entering with any machinery. On early Tuesday, 30 June, about 150 ESMAD (anti-riot police) arrived and forced the protestors to evacuate their camp with an eviction notice from an unidentified source causing a peaceful demonstration to turn into a violent clash. Three campesinos were injured by blows to the arms and legs while peaceful protest flags were burned by ESMAD forces. All of the competent local authorities including the Mayor, the Governor, a representative of the environmental agency, the president of the Chamber of Commerce, the Bishop’s representative (Catholic Church) and the Representante a la Camera por Caquetá signed a letter requesting that the Colombian Government: to respect the rights of the victims to return to their land and not to re-victimise them, to protect the campesino economy in the region and to hold a national debate in Congress on the development model for the Colombian Amazon region. They also called for a moratorium on the mining project and to suspend the mining concession given to Emerald Energy Plc in ‘el Nogal Block’ and other concessions granted in the department (County). Locals do not understand who exactly is behind the attack on Tuesday and the mysterious eviction notice. Carolina Rueda, the official from Emerald Energy Plc. in charge of Valparaiso, told El Espectador’s Rio Blog that she was not authorised to comment on the incident that occurred on 30 June 2015. Deputy Interior Minister Carlos Ferro confirmed on 2 July that he would travel to Valparaiso with Emerald Energy and the National Hydrocarbons Agency (ANH) in order to speak with the community and local leaders. • El Espectador, “Campesinos del Caqueta se le plantearon al ESMAD para impedir ingreso de petroleras en la Amazonia” (3 July 2015). • Asociacion Ambiente y Sociedad, “Valparaiso, Caqueta: un dilema entre petroleo y agua” (8 July 2015).